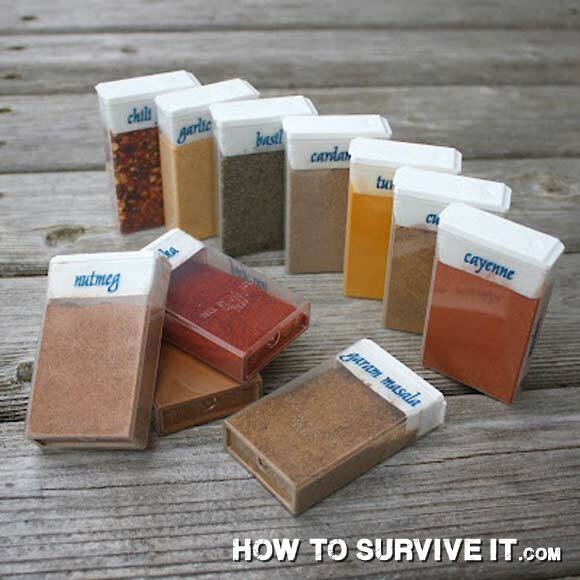 Budget Barbie: Spices in tiny containers for backpacking and camping! Spices in tiny containers for backpacking and camping! When life gets crazy busy I usually forget to take photos of all the kazillion projects I'm doing... and I never get around to posting the ones I DO have in my files. Also... those super cool or useful ideas I stumble upon and want to post (for me mostly... but also to share with readers!) - yeah, those stay living in my computer files as well. Not today. No siree Bob! Here is an idea I looooooove and have had in my files forever but today it needs to come out! It needs to be shared. Is this not the easiest idea ever???? Tic-Tac containers filled with the spices or herbs you use most in your cooking; all bundled up tiny so you can put them in your bug-out bag, camping gear, backpack. I found this on the net (you can see the website below if you want to check them out!! ).